The Crucial 16GB 240-Pin RDIMM DDR3 PC3-12800 Memory Module provides additional performance for handling multiple tasks on your server or desktop system. 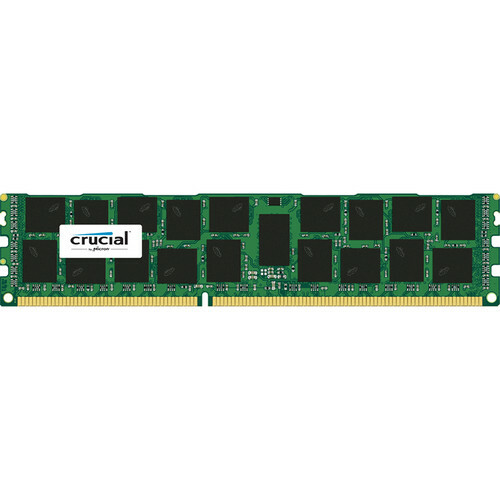 This memory module has a capacity of 16GB and occupies an available 240-pin DIMM slot inside your system. It is registered memory with ECC to offer stability and reliability. Furthermore, this memory chip has a cas latency of 11, 1600 MT/s memory speeds, and uses 1.35 V.
Box Dimensions (LxWxH) 5.6 x 1.7 x 0.4"
16GB 240-Pin RDIMM DDR3 PC3-12800 Memory Module is rated 5.0 out of 5 by 1. Rated 5 out of 5 by VMtester from Works in Lenovo Thinkstation D30 Upgraded from 32GB to 64GB using two of these. Installation was simple, system recognized them right away.